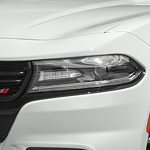 Driving Around In The 2019 Dodge Charger Is An Experience To Try Firsthand | Elgin Chrysler Ltd. Arriving at Elgin Chrysler Ltd. in search of your next vehicle can fill you with boundless excitement. A vehicle that excels in performance while also providing features that make driving fun is the treasure that most are searching for on a car lot. For many, the 2019 Dodge Charger will be such a treasure. Getting behind the wheel of the Dodge Charger is like opening up a treasure chest. There are a number of features such as the available Drive Modes. Accessed through the Uconnect touchscreen, this feature allows drivers to personalize the driving experience by setting the engine, transmission, and steering to the selection that they prefer. Travelling the streets of St. Thomas will be moments filled with sonic bliss due to the available audio systems. There are three in total and each provides rich sound. Drivers can choose between the six-speaker Alpine system, the nine-speaker Alpine system, and the over the top 19-speaker Harmon Kardon audio system.